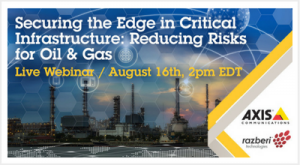 Join Axis Communications and Razberi Technologies for a 30-minute webinar to discuss why Oil & Gas must cyber harden IoT devices at the edge and what solutions make it viable. Expert panelists will share top security recommendations and pragmatic information on how to secure the edge, leverage automation, configure devices and remotely monitor for IoT health and threats. This session will help security and IT professionals analyze their risk of potential threats and reduce risks in terms of production losses, data theft, interruptions and more that cost millions of dollars to the industry. Can’t make the live event? Register anyway and we’ll share the link to the on-demand recording.